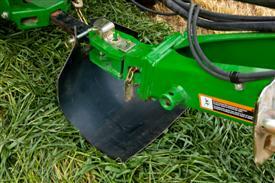 Side flares prevent hay from blowing off the pickup ends and reduce hay loss. 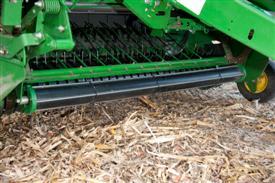 The closely spaced pickup teeth extend to the baler side sheets to help build straight-edged bales. 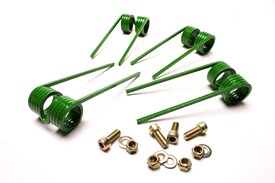 Standard on regular and MegaTooth™ pickups, compressor rods are contoured to control hay over the pickup radius for positive feeding. 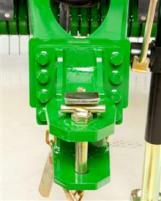 The compressor rack can be adjusted upward or downward to match the volume of material in windrow and can be easily removed to match crop conditions. 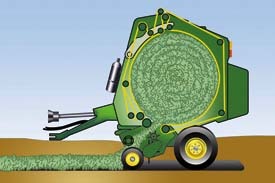 John Deere's 17.8-cm (7-in.) 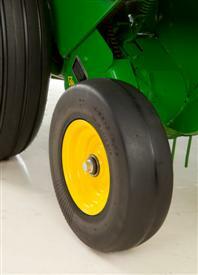 wide diamond-tread design ensures fast bale starts and grips the bale to prevent slippage and reduce chaffing. 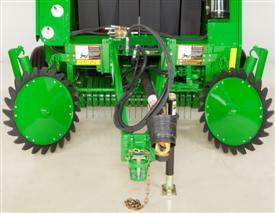 The treads are self-cleaning to reduce carryover. 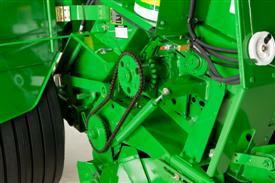 The belts enclose 91 percent of the bale width to reduce the loss of fine material and retain hay quality. 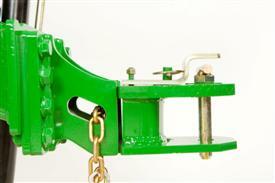 They have the strength to handle heavy-shock loads and help to maintain consistent belt length. 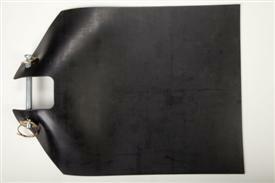 Polyester is used for increased strength and reduced belt stretch. 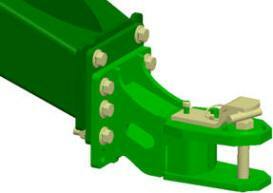 Flat surface reduces wear on the splice as the belt travels around the rolls. 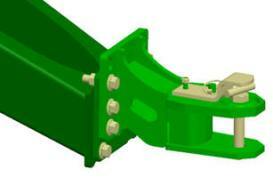 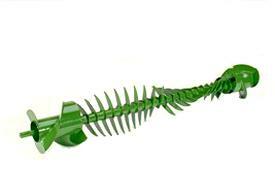 Strong hook shape increases the splice life as the belt flexes. 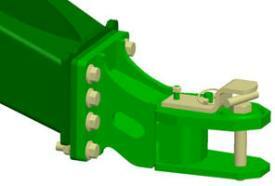 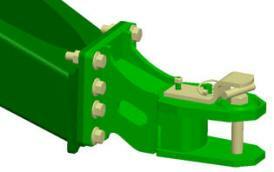 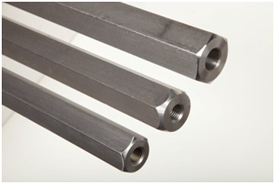 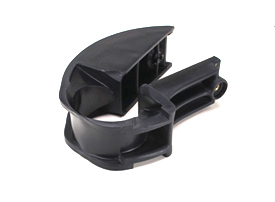 The material thickness and bend radius resist the opening of hook points and reduce metal fatigue. 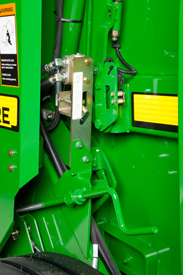 On the 449 Baler Round Baler with hydraulic double-twine option, the near-full bale size warning can be adjusted by moving the nut (1) in the slot to match harvest requirements. 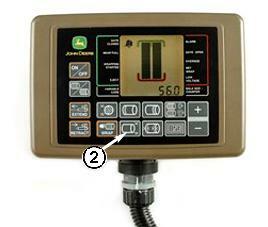 The bale size on 459, 459E with automatic electric tie, 459 Silage Special, 559, 469, 469 Silage Special, and 569 Round Balers can be adjusted from the operator's station with the BaleTrak™ Pro monitor-controller by pressing symbol 2, then pushing the +/- symbol. 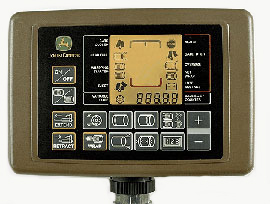 The BaleTrak Pro monitor-controller is included with the automatic electric tie option and the Edge-to-Edge option on the 459E. 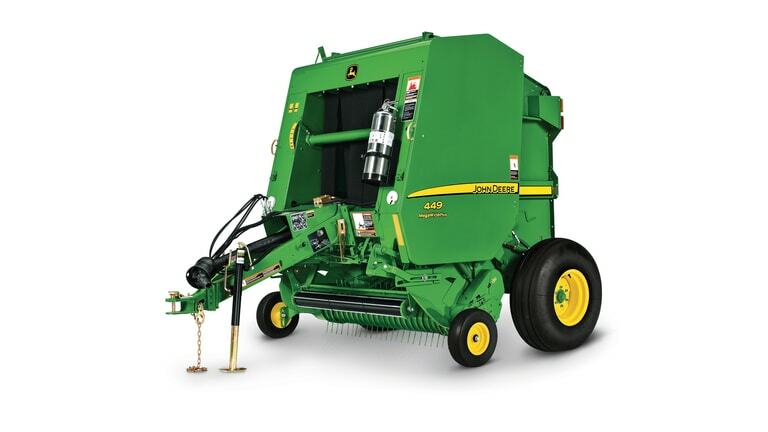 The monitor sounds an alarm for near-full, full, and oversized bales. 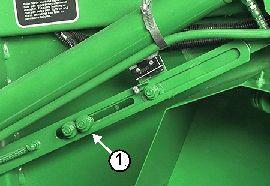 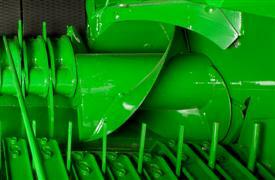 Bale shape bars are not available on the 449 or 459E Round Balers. 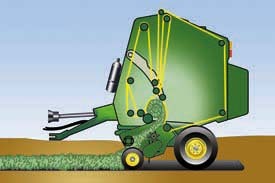 The 449 and 459E Round Balers allow for adjustment of twine settings from the cab by using the BaleTrak Pro Monitor. 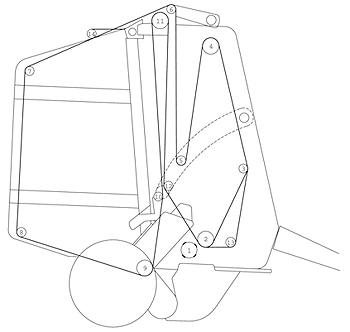 The number of wraps on the Edge-to-Edge netwrap option on the 459E can be set with the BaleTrak Pro.